Kristina Werner had a lesson on Day 5 of stenciled watercolor. I used The Crafters Workshop "Mini Rosetta" stencil for this card. I adhered it to a piece of Strathmore Smooth Bristol paper with repositionable spray adhesive, and colored with my Zig Clean Color Real Brush Markers & a water brush. When that was dry, I removed the stencil, and stamped my greeting from Our Daily Bread Designs' "Christmas Ornament" set in the lower left corner. I rounded the 2 opposite corners of my panel with the 1/2" side of my Corner Chomper. I matted that with black and then with pink, rounding the corresponding corners each time. Finally, I adhered it to a white A2 card base. 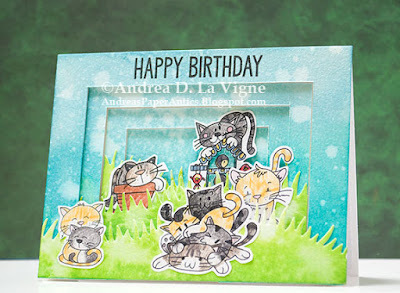 Gina K., a guest instructor, inspired this next card. I used one of the branch images from WPlus9's "Spring Blooms" stamp set with Altenew Forest Glades & Hero Arts Forever Green inks to make my wreath. I filled in with a berry stamp from the same set with Altenew Ruby Red ink. 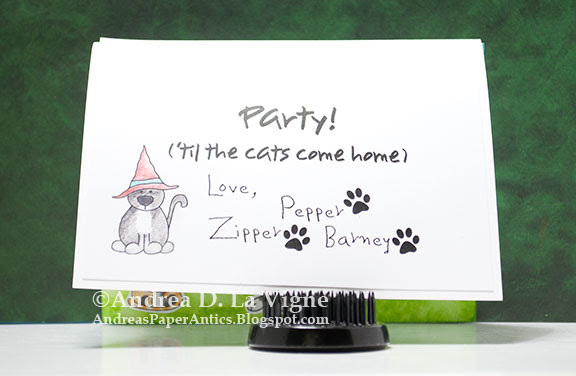 For the greeting, I stamped a banner from Avery Elle's "Build a Banner" set (discontinued) onto white cardstock, and heat embossed with Ranger Super Fine Detail Gold embossing powder. 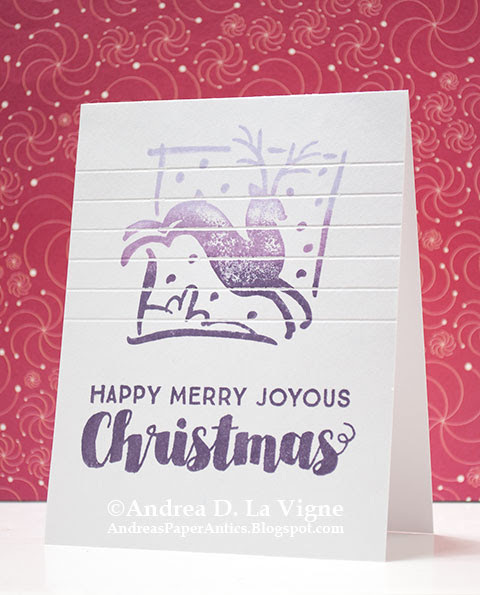 I curved the greeting, from Hero Arts' "Vintage Christmas Post" stamp set, to match the curve of the banner, and stamped & gold heat embossed that as well. Finally, I die cut it with the coordinating "Build a Banner" die. I tied a bow with some red satin ribbon, and adhered it to the top of my wreath with a glue dot. I adhered my banner in place, using foam tape in the middle and Scor Tape at either end. I matted that panel with black, and adhered it to a piece of green cardstock, before mounting it to a white card base. 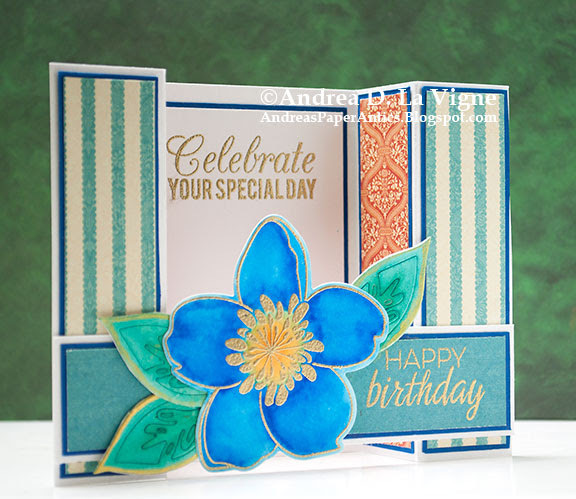 Jennifer McGuire had a lesson on Day 1 of class that inspired this card. I took a piece of blue cardstock that I had cut to 4x5.25", spattered water on it, and heat embossed with Recollections Snow embossing powder for the background. I die cut Winnie & Walter's "Peace" die 4 times from navy cardstock, and glued them all together with Ranger Multi Medium Matte. 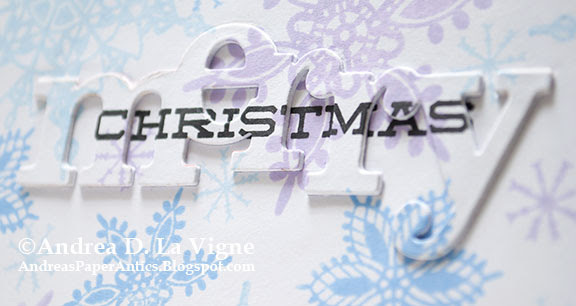 After that dried, I heat embossed along the top of the die cut with white, to make it look like snow. 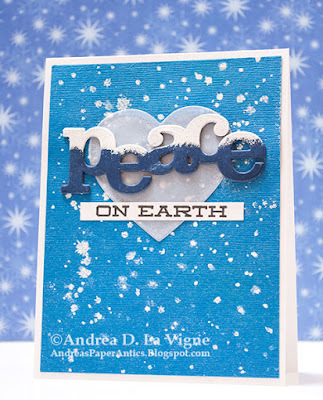 I stamped "on Earth" from Clearly Besotted's "Holiday Sentiments" set (apparently discontinued) onto a scrap of white cardstock. I cut that into a strip to go under my die cut "peace." I die cut a heart from vellum using Little B's "Hearts" die set. I positioned the heart on my background, and taped it in place with a couple of small pieces of painter's tape. I glued my "peace" on top of that, and glued the white strip below it, then removed the tape. I did not actually adhere the vellum directly to my panel; the glue on the greeting pieces is all that holds it in place. Finally, I mounted my card panel to a white A2 card base. 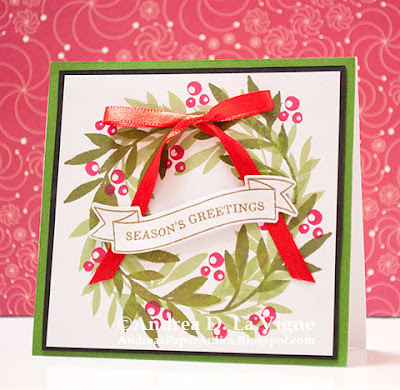 Julie Ebersole had a lesson on Day 4 of "Merry Making" at Online Card Classes on camouflage die cutting. I've done this before, but I still love how it produces that, "How'd she do that???" factor! I stamped a panel of white cardstock with images from My Favorite Things' "Sophisticated Snowflake," (discontinued) using Hero Arts Cornflower & Soft Lilac and Memento Summer Sky inks. 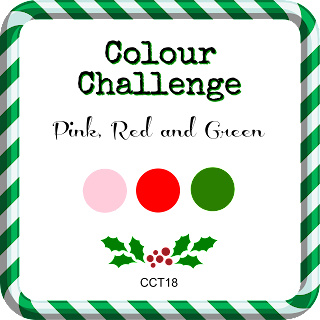 I filled in some of the small empty areas with a snowflake image from Hero Arts' "Color Layering Christmas Tree." Once I'd finished, I stamped the "Christmas" from Clearly Besotted's "Holiday Sentiments" (apparently discontinued) in Versafine Onyx Black ink. I used the "Merry" die from Winnie & Walter to complete my greeting. I die cut it from the panel, and 4 more times from white cardstock. I stacked those together, and adhered it back into the negative space in my stamped panel. I really love how this came out! 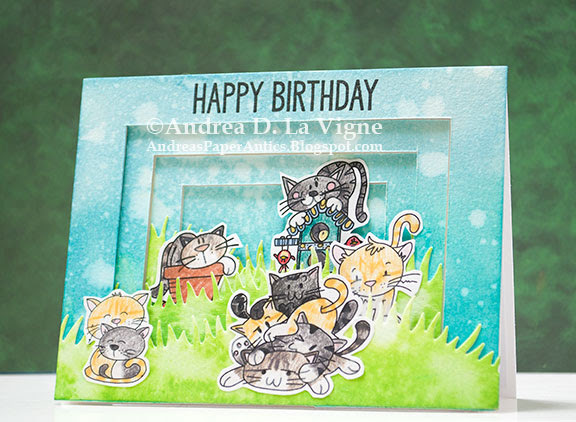 On Day 1 of Online Card Classes' "Merry Making" class, Kristina Werner had a lesson on bokeh backgrounds. I created this card based on that lesson. I cut a panel of 140 lb. watercolor paper and taped it to a cutting board. I used Peacock Feathers & Faded Jeans Distress Oxide inks, adding a bit of Black Soot Distress ink at the bottom to create an ombre. Then I did the bokeh effect with a wet paintbrush, following the instructions in Kristina's tutorial. 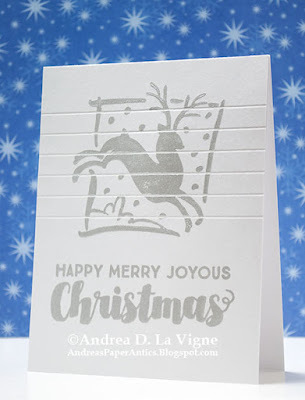 I stamped several snowflakes from My Favorite Things' "Sophisticated Snowflake" set (discontinued), and heat embossed with Ranger Silver embossing powder. 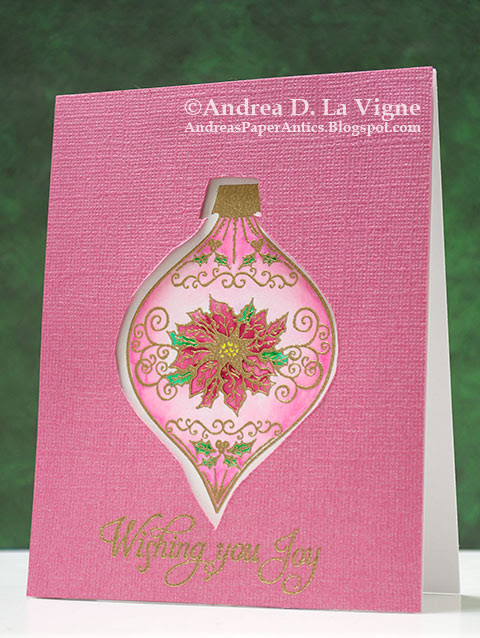 I stamped some additional snowflakes with Lawn Fawn Yeti white pigment ink, just for another, more subtle look. For my greeting, I used Simon Says Stamp's "Christmas Blessings" die. I cut it once from white cardstock & again from black. I glued the black onto my panel, then overlaid the white, slightly offset to give a shadow appearance. To finish my card, I matted my panel in grey & navy cardstocks, trimming a 1/16" border on each. Then I adhered it to a white A2 card base. On Day 2 of Online Card Classes' "Merry Making" class, Jennifer McGuire had a lesson on using scoring lines through an image on your card. I ended up making 2 cards with this technique. After scoring my panel for my first card, I placed it in my MISTI and positioned my reindeer stamp. (This stamp is quite old, and I have no clue who made it or what the name is.) I inked up the top portion of the stamp with Hero Arts Soft Lilac ink, and daubed the lower edge of the ink with a dry cloth to soften the transition. I stamped that on my panel, inked up again in the middle of the image with Memento Sweet Plum, daubed the top & bottom edges, and stamped. I repeated one more time with Memento Elderberry ink for the bottom portion of the stamp. I also stamped the greeting, from My Favorite Things' "Joyous Christmas Sentiments," (discontinued) in Elderberry. On my second card, I did the same basic steps. This time, though, instead of 3 dye inks, I used just Delicata Silvery Shimmer pigment ink. I had a few more spots on the score lines where the ink got in the groove than on my first card. But, on both cards, I just touched those areas up with a white gel pen. All that was left was to adhere the panels to white A2 card bases. These cards really came together quickly, and I can see where this technique would be good for mass production. The current theme at the Lawn Fawnatics Challenge is "Happy Little Critters." 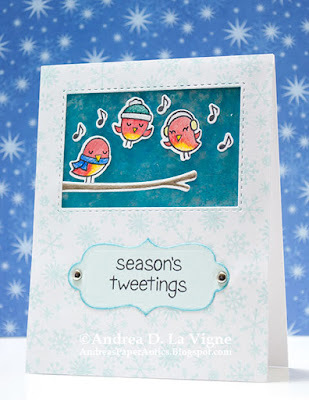 I made this holiday card using mainly Lawn Fawn's "Winter Sparrows" stamps & coordinating dies. 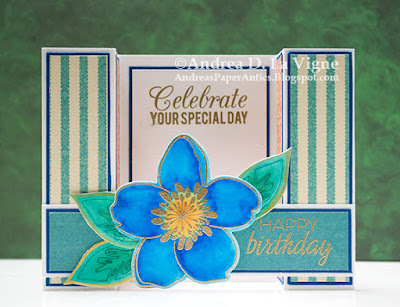 I began by coloring a piece of acetate with Sail Boat Blue, Stream, & Silver Mixative alcohol inks, following this Splitcoaststampers.com tutorial. I applied the inks with a blending tool & felt pad. While that dried, I die cut a window from a piece of white cardstock with a Simon Says Stamp "Stitched Rectangles" die. To decorate my panel, I stamped several snowflakes in Hero Arts Soft Pool ink. 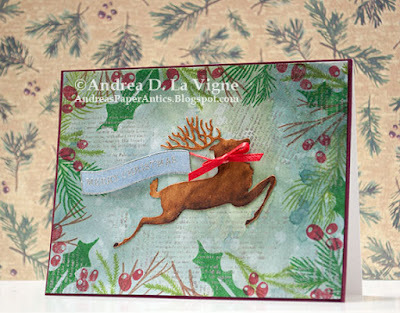 I used stamps from "Winter in the Park" & "Deck the Halls," both by Lawn Fawn. I also stamped the birds and notes with Memento Tuxedo Black ink. I stamped the branch with Hero Arts Wet Cement ink, and shaded it with 2 brown Prismacolor colored pencils. I also colored the birds with colored pencils, & die cut all my images. I stamped the greeting from "Winter Sparrows" in Tuxedo Black onto a pale blue cardstock, and die cut it with a Spellbinders "Grommet Tags" die (discontinued). I inked the edges with Broken China Distress ink, just to help it stand out from the background a bit more. For the scene, I first glued the end of the branch behind the window in my cardstock frame. I adhered the acetate to the back with Scor Tape, and glued my birds & music notes to that. I also added a little more liquid glue under the branch, just to keep it steady. I adhered my greeting to the panel with ATG adhesive, pierced a hole at either end of the tag, and inserted 2 silver mini brads. Finally, I popped the panel up with foam tape onto a white A2 card base. I'm also entering this card in Incy Wincy Designs' "Let's Celebrate" challenge. 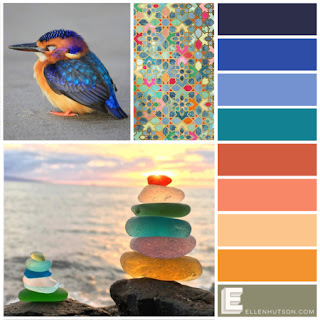 Ellen Hutson has their September Pin-Sights challenge up. In fact, this is the last day to enter! I created this card for a friend of mine whose birthday is coming up soon. I decided, after reading this tutorial, to make a bridge card. A special card for a special friend! I created the card base from white 110 lb. cardstock. I cut patterned paper strips from 2 papers in Graphic 45's "Couture" 6x6" pad. I matted them with navy, and adhered them in place on the card base. 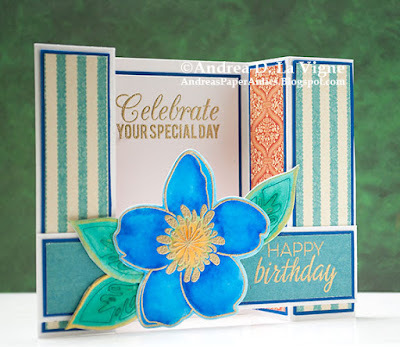 For the focal image, I used the Essentials by Ellen "Mondo Magnolia" stamp set. 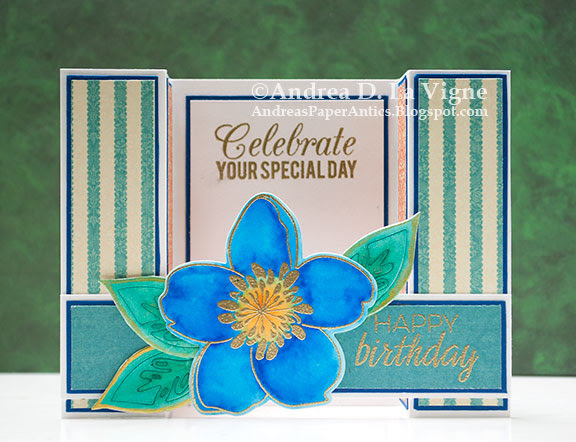 The full flower was a bit too large, but fortunately, the coordinating die set has a die that cuts out the middle section of petals. I stamped it on Strathmore Smooth Bristol paper with Versamark ink, & heat embossed with Ranger Super Fine Detail Gold embossing powder. I colored the flower with 2 blue Tombow markers, using a water brush to help blend the colors & add shading. I did the center with an orange marker. Because the flower was on a different paper than the card base, I knew the whites wouldn't match, so I just colored the edges of the flower blue. Finally, I die cut it with the coordinating die. I wanted leaves, but the "Mondo Magnolia" set has none. So I pulled one of the dies in the "Wild Garden" set, also from the Essentials by Ellen line. I die cut it 3 times from a scrap of bristol, and colored it with a teal-green Tombow marker & water brush. To tie in with the gold embossing, I painted around the edges of the leaves with gold paint from the Gansai Tambi Starry Colors set. The die cuts out the inner portion of the leaf, but I wanted the whole thing intact. So I just adhered the die cut leaves to white cardstock, & fussy cut around them. For the greetings, I pulled stamps from 2 sets: Winnie and Walter's "The Party," & My Favorite Things' "Birthday Greetings." I stamped the latter onto a panel of white cardstock that I had matted with navy, and gold heat embossed it, before adhering it to my card base. For the "Happy Birthday," I cut a piece of the striped patterned paper I'd used for two of the vertical panels. It has a mottled teal pattern on the back side, so I stamped & heat embossed on that. I matted that strip with navy as well, adhered it to the "bridge" strip for my card, and used Scor Tape to adhere that to my card base. Finally, I glued my flower & leaves in place, and the card was finished! 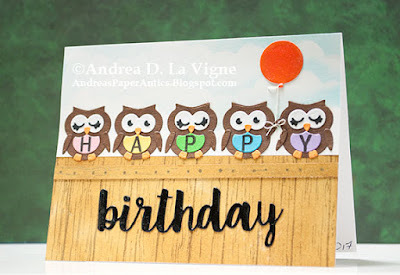 I'm also entering my card in Simon Says Stamp's Wednesday "Anything Goes" challenge.